Pollination is the transfer of pollen from a male part of a plant to a female part of a plant, later enabling fertilisation and the production of seeds, most often by an animal or by wind. Pollinating agents are animals such as insects, birds, and bats; water; wind; and even plants themselves, when self-pollination occurs within a closed flower. Pollination often occurs within a species. When pollination occurs between species it can produce hybrid offspring in nature and in plant breeding work. In angiosperms, after the pollen grain has landed on the stigma, it develops a pollen tube which grows down the style until it reaches an ovary. Sperm cells from the pollen grain then move along the pollen tube, enter an ovum cell through the micropyle and fertilise it, resulting in the production of a seed. Pollination may be biotic or abiotic. Biotic pollination relies on living pollinators to move the pollen from one flower to another. Abiotic pollination relies on wind, water or even rain. About 80% of angiosperms rely on biotic pollination. Abiotic pollination uses nonliving methods such as wind and water to move pollen from one flower to another. 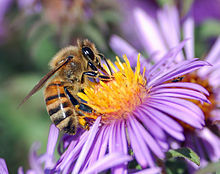 This allows the plant to spend energy directly on pollen rather than on attracting pollinators with flowers and nectar. Some 98% of abiotic pollination is anemophily, pollination by wind. This probably arose from insect pollination, most likely due to changes in the environment or the availability of pollinators. The transfer of pollen is more efficient than previously thought; wind pollinated plants have developed to have specific heights, in addition to specific floral, stamen and stigma positions that promote effective pollen dispersal and transfer. Pollination by water, hydrophily, uses water to transport pollen, sometimes as whole anthers; these can travel across the surface of the water to carry dry pollen from one flower to another. In Vallisneria spiralis, an unopened male flower floats to the surface of the water, and, upon reaching the surface, opens up and the fertile anthers project forward. The female flower, also floating, has its stigma protected from the water, while its sepals are slightly depressed into the water, allowing the male flowers to tumble in. Rain pollination is used by a small percentage of plants. Heavy rain discourages insect pollination and damages unprotected flowers, but can itself disperse pollen of suitably adapted plants, such as Ranunculus flammula, Narthecium ossifragum, and Caltha palustris. In these plants, excess rain drains allowing the floating pollen to come in contact with the stigma. In rain pollination in orchids, the rain allows for the anther cap to be removed, allowing for the pollen to be exposed. 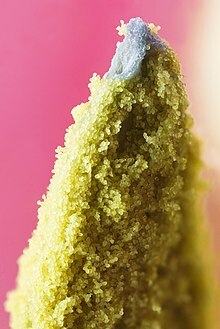 After exposure, raindrops causes the pollen to be shot upward, when the stipe pulls them back, and then fall into the cavity of the stigma. Thus, for the orchid Acampe rigida, this allows the plant to self-pollinate, which is useful when biotic pollinators in the environment have decreased. It is possible for a plant have varying pollination methods, including both biotic and abiotic pollination. The orchid Oeceoclades maculata uses both rain and butterflies, depending on its environmental conditions. More commonly, pollination involves pollinators (also called pollen vectors): organisms that carry or move the pollen grains from the anther of one flower to the receptive part of the carpel or pistil (stigma) of another. Between 100,000 and 200,000 species of animal act as pollinators of the world's 250,000 species of flowering plant. The majority of these pollinators are insects, but about 1,500 species of birds and mammals visit flowers and may transfer pollen between them. Besides birds and bats which are the most frequent visitors, these include monkeys, lemurs, squirrels, rodents and possums. In zoophily, pollination is performed by vertebrates such as birds and bats, particularly, hummingbirds, sunbirds, spiderhunters, honeyeaters, and fruit bats. Ornithophily or bird pollination is the pollination of flowering plants by birds. Chiropterophily or bat pollination is the pollination of flowering plants by bats. Plants adapted to use bats or moths as pollinators typically have white petals, strong scent and flower at night, whereas plants that use birds as pollinators tend to produce copious nectar and have red petals. Insect pollinators such as honey bees (Apis spp. ),bumblebees (Bombus spp. ), and butterflies (e.g., Thymelicus flavus) have been observed to engage in flower constancy, which means they are more likely to transfer pollen to other conspecific plants. This can be beneficial for the pollinators, as flower constancy prevents the loss of pollen during interspecific flights and pollinators from clogging stigmas with pollen of other flower species. It also improves the probability that the pollinator will find productive flowers easily accessible and recognisable by familiar clues. Some flowers have specialized mechanisms to trap pollinators to increase effectiveness. Other flowers will attract pollinators by odor. For example, bee species such as Euglossa cordata are attracted to orchids this way, and it has been suggested that the bees will become intoxicated during these visits to the orchid flowers, which last up to 90 minutes. However, in general, plants that rely on pollen vectors tend to be adapted to their particular type of vector, for example day-pollinated species tend to be brightly coloured, but if they are pollinated largely by birds or specialist mammals, they tend to be larger and have larger nectar rewards than species that are strictly insect-pollinated. They also tend to spread their rewards over longer periods, having long flowering seasons; their specialist pollinators would be likely to starve if the pollination season were too short. Mammals are not generally thought of as pollinators, but some rodents, bats and marsupials are significant pollinators and some even specialise in such activities. In South Africa certain species of Protea (in particular Protea humiflora, P. amplexicaulis, P. subulifolia, P. decurrens and P. cordata) are adapted to pollination by rodents (particularly Cape Spiny Mouse, Acomys subspinosus) and elephant shrews (Elephantulus species). The flowers are borne near the ground, are yeasty smelling, not colourful, and sunbirds reject the nectar with its high xylose content. The mice apparently can digest the xylose and they eat large quantities of the pollen. In Australia pollination by flying, gliding and earthbound mammals has been demonstrated. Examples of pollen vectors include many species of wasps, that transport pollen of many plant species, being potential or even efficient pollinators. An estimated 48.7% of plant species are either dioecious or self-incompatible obligate out-crossers. It is also estimated that about 42% of flowering plants have a mixed mating system in nature. In the most common kind of mixed mating system, individual plants produce a single type of flower and fruits may contain self-pollinated, out-crossed or a mixture of progeny types. Pollination also requires consideration of pollenizers, the plants that serve as the pollen source for other plants. Some plants are self-compatible (self-fertile) and can pollinate and fertilize themselves. Other plants have chemical or physical barriers to self-pollination. The first fossil record for abiotic pollination is from fern-like plants in the late Carboniferous period. Gymnosperms show evidence for biotic pollination as early as the Triassic period. Many fossilized pollen grains show characteristics similar to the biotically dispersed pollen today. Furthermore, the gut contents, wing structures, and mouthpart morphology of fossilized beetles and flies suggest that they acted as early pollinators. The association between beetles and angiosperms during the early Cretaceous period led to parallel radiations of angiosperms and insects into the late Cretaceous. The evolution of nectaries in late Cretaceous flowers signals the beginning of the mutualism between hymenopterans and angiosperms. An Andrena bee gathers pollen from the stamens of a rose. The female carpel structure appears rough and globular to the left. Pollination management is a branch of agriculture that seeks to protect and enhance present pollinators and often involves the culture and addition of pollinators in monoculture situations, such as commercial fruit orchards. The largest managed pollination event in the world is in Californian almond orchards, where nearly half (about one million hives) of the US honey bees are trucked to the almond orchards each spring. New York's apple crop requires about 30,000 hives; Maine's blueberry crop uses about 50,000 hives each year. The US solution to the pollinator shortage, so far, has been for commercial beekeepers to become pollination contractors and to migrate. Just as the combine harvesters follow the wheat harvest from Texas to Manitoba, beekeepers follow the bloom from south to north, to provide pollination for many different crops. In America, bees are brought to commercial plantings of cucumbers, squash, melons, strawberries, and many other crops. Honey bees are not the only managed pollinators: a few other species of bees are also raised as pollinators. The alfalfa leafcutter bee is an important pollinator for alfalfa seed in western United States and Canada. Bumblebees are increasingly raised and used extensively for greenhouse tomatoes and other crops. In some instances growers’ demand for beehives far exceeds the available supply. The number of managed beehives in the US has steadily declined from close to 6 million after WWII, to less than 2.5 million today. In contrast, the area dedicated to growing bee-pollinated crops has grown over 300% in the same time period. Additionally, in the past five years there has been a decline in winter managed beehives, which has reached an unprecedented rate of colony losses at near 30%. At present, there is an enormous demand for beehive rentals that cannot always be met. There is a clear need across the agricultural industry for a management tool to draw pollinators into cultivations and encourage them to preferentially visit and pollinate the flowering crop. By attracting pollinators like honey bees and increasing their foraging behavior, particularly in the center of large plots, we can increase grower returns and optimize yield from their plantings. ISCA Technologies, from Riverside California, created a semiochemical formulation called SPLAT Bloom, that modifies the behavior of honey bees, inciting them to visit flowers in every portion of the field. Loss of pollinators, also known as Pollinator decline (of which colony collapse disorder is perhaps the most well known) has been noticed in recent years. These loss of pollinators have caused a disturbance in early plant regeneration processes such as seed dispersal and of course, pollination. Early processes of plant regeneration greatly depend on plant-animal interactions and because these interactions are interrupted, biodiversity and ecosystem functioning are threatened. Pollination by animals aids in the genetic variability and diversity within plants because it allows for out-crossing instead for self-crossing. Without this genetic diversity there would be a lack of traits for natural selection to act on for the survival of the plant species. Seed dispersal is also important for plant fitness because it allows plants the ability to expand their populations. More than that, it permits plants to escape environments that have changed and have become difficult to reside in. All of these factors show the importance of pollinators for plants, which are the foundation for a stable ecosystem. If only a few species of plants depended on pollinators the overall effect would not be as devastating however, this is not the case. It is known that more than 87.5% of angiosperms, over 75% of tropical tree species, and 30-40% of tree species in temperate regions depend on pollination and seed dispersal. Possible explanations for pollinator decline include habitat destruction, pesticide, parasitism/diseases, and climate change. It has also been found that the more destructive forms of human disturbances are land use changes such as fragmentation, selective logging, and the conversion to secondary forest habitat. Defaunation of frugivores has also been found to be an important driver. These alterations are especially harmful due to the sensitivity of the pollination process of plants. There was a study done on tropical palms and the researchers concluded that defaunation has caused a decline in seed dispersal, which causes a decrease in genetic variability in this species. Habitat destruction such as fragmentation and selective logging remove area that are most optimal for the different types of pollinators, which removes pollinators food resources, nesting sites, and leads to isolation of populations. The effect of pesticides on pollinators has been debated due to the difficulty to be confident that a single pesticide is the cause and not a mixture or other threats. It is also not know if exposure alone causes damages, or if the duration and potency are also factors. However, insecticides do have some negative effects, such as neonicotinoids that harm bee colonies. Many researchers believe it is the synergistic effects of these factors which are ultimately detrimental to pollinator populations. The most known and understood pollinator, bees, have been used as the prime example of the decline in pollinators. Bees are essential in the pollination of agricultural crops and wild plants and are one of the main insects that perform this task. Out of the bees species, the honey bee or Apis mellifera has been studied the most and in the United States, there has been a loss of 59% of colonies from 1947 to 2005. The decrease in populations of the honey bee have been attributed to pesticides, genetically modified crops, fragmentation, parasites and diseases that have been introduced. There has been a focus on neonicotinoids effects on honey bee populations. Neonicotinoids insecticides have been used due to its low mammalian toxicity, target specificity, low application rates, and broad spectrum activity. However, the insecticides are able to make its way throughout the plant, which includes the pollen and nectar. Due to this, it has been shown to effect on the nervous system and colony relations in the honey bee populations. Butterflies too have suffered due to these modifications. Butterflies are helpful ecological indicators since they are sensitive to changes within the environment like the season, altitude, and above all, human impact on the environment. Butterfly populations were higher within the natural forest and were lower in open land. The reason for the difference in density is the fact that in open land the butterflies would be exposed to desiccation and predation. These open regions are caused by habitat destruction like logging for timber, livestock grazing, and firewood collection. Due to this destruction, butterfly species' diversity can decrease and it is known that there is a correlation in butterfly diversity and plant diversity. Besides the imbalance of the ecosystem caused by the decline in pollinators, it may jeopardise food security. Pollination is necessary for plants to continue their populations and 3/4 of the world's food supply are plants that require pollinators. Insect pollinators, like bees, are large contributors to crop production, over 200 billion dollars worth of crop species are pollinated by these insects. Pollinators are also essential because they improve crop quality and increase genetic diversity, which is necessary in producing fruit with nutritional value and various flavors. Crops that do not depend on animals for pollination but on the wind or self-pollination, like corn and potatoes, have doubled in production and make up a large part of the human diet but do not provide the micronutrients that are needed. The essential nutrients that are necessary in the human diet are present in plants that rely on animal pollinators. There have been issues in vitamin and mineral deficiencies and it is believed that if pollinator populations continue to decrease these deficiencies will become even more prominent. ^ Barrows, E. M. 2011. Animal Behavior Desk Reference. A Dictionary of Animal Behavior, Ecology, and Evolution. Third Edition. CRC Press LCC, Boca Raton, FL. 794 pp. ^ Raghavan, Valayamghat (1997). Molecular Embryology of Flowering Plants. Cambridge University Press. pp. 210–216. ISBN 978-0-521-55246-2. ^ a b c d Campbell, Neil A.; Reece, Jane B. (2002). Biology (6th edition). Pearson Education. pp. 600–612. ISBN 978-0-201-75054-6. ^ a b Runions, C. John; Owens, John N. (1999). "Sexual reproduction of interior spruce (Pinaceae). I. Pollen germination to archegonial maturation". International Journal of Plant Sciences. 160 (4): 631–640. doi:10.1086/314170. ^ Ackerman, J. D. (2000-03-01). "Abiotic pollen and pollination: Ecological, functional, and evolutionary perspectives". Plant Systematics and Evolution. 222 (1–4): 167–185. doi:10.1007/BF00984101. ^ Faegri, K.; Pijl, L. Van Der (2013-10-22). Principles of Pollination Ecology. Elsevier. p. 34. ISBN 9781483293035. ^ Whitehead, Donald R. (1969). "Wind Pollination in the Angiosperms: Evolutionary and Environmental Considerations". Evolution. 23 (1): 28–35. doi:10.2307/2406479. JSTOR 2406479. PMID 28562955. ^ Culley, Theresa M.; Weller, Stephen G.; Sakai, Ann K. (2002-08-01). "The evolution of wind pollination in angiosperms". Trends in Ecology & Evolution. 17 (8): 361–369. doi:10.1016/S0169-5347(02)02540-5. ^ Friedman, Jannice; Barrett, Spencer C. H. (2009-06-01). "Wind of change: new insights on the ecology and evolution of pollination and mating in wind-pollinated plants". Annals of Botany. 103 (9): 1515–1527. doi:10.1093/aob/mcp035. PMC 2701749. PMID 19218583. ^ a b Cox, Paul Alan (1988). "Hydrophilous Pollination". Annual Review of Ecology and Systematics. 19: 261–279. doi:10.1146/annurev.es.19.110188.001401. JSTOR 2097155. ^ a b Hagerup, O. 1950. Rain-pollination. I kommission hos E. Munksgaard. Retrieved 26 May 2018. ^ Fan, Xu-Li; Barrett, Spencer C. H.; Lin, Hua; Chen, Ling-Ling; Zhou, Xiang; Gao, Jiang-Yun (2012-10-01). "Rain pollination provides reproductive assurance in a deceptive orchid". Annals of Botany. 110 (5): 953–958. doi:10.1093/aob/mcs1654 (inactive 2019-03-11). ^ Aguiar, João M. R. B. V.; Pansarin, Ludmila M.; Ackerman, James D.; Pansarin, Emerson R. (2012). "Biotic versus abiotic pollination in Oeceoclades maculata (Lindl.) Lindl. (Orchidaceae)". Plant Species Biology. 27 (1): 86–95. doi:10.1111/j.1442-1984.2011.00330.x. ^ "Types of Pollination, Pollinators and Terminology". CropsReview.Com. Retrieved 2015-10-20. ^ a b Abrol, Dharam P. (2012). Non Bee Pollinators-Plant Interaction. Pollination Biology. Chapter 9. pp. 265–310. doi:10.1007/978-94-007-1942-2_9. ISBN 978-94-007-1941-5. ^ "First ever record of insect pollination from 100 million years ago". ScienceDaily. Retrieved 2015-10-20. ^ Rodríguez-Gironés, Miguel A.; Santamaría, Luis (2004). "Why are so many bird flowers red?". PLoS Biology. 2 (10): e306. doi:10.1371/journal.pbio.0020350. PMC 521733. PMID 15486585. ^ Hill, P. S. M.; Wells, P. H.; Wells, H. (1997). "Spontaneous flower constancy and learning in honey bees as a function of colour". Animal Behaviour. 54 (3): 615–627. doi:10.1006/anbe.1996.0467. ^ Stout, J. C.; Allen, J. A.; Goulson, D. (1998). "The influence of relative plant density and floral morphological complexity on the behaviour of bumblebees". Oecologia. 117 (4): 543–550. doi:10.1007/s004420050691. PMID 28307680. ^ Chittka, L.; Gumbert, A.; Kunze, J. (1997). "Foraging dynamics of bumble bees: correlates of movement within and between plant species". Behavioral Ecology. 8 (3): 239–249. doi:10.1093/beheco/8.3.239. ^ Goulson, D.; Ollerton, J.; Sluman, C. (1997). "Foraging strategies in the small skipper butterfly, Thymelicus flavus: when to switch?". Animal Behaviour. 53 (5): 1009–1016. doi:10.1006/anbe.1996.0390. ^ Harder, L. D.; Williams, N. M.; Jordan, C. Y.; Nelson, W. A. "The effects of Floral design and display on pollinator economics and pollen dispersal". 297–317. ^ Editors, L. Chittka and J. D. Thomson. Cognitive Ecology of Pollination: Animal Behavior and Floral Evolution. 2001. Cambridge University Press. ^ Chittka, L.; Thomson, J. D.; Waser, N. M. (1999). "Flower constancy, insect psychology, and plant evolution". Naturwissenschaften. 86 (8): 361–377. doi:10.1007/s001140050636. ^ Dressler, Robert L. (1968-03-01). "Pollination by Euglossine Bees". Evolution. 22 (1): 202–210. doi:10.2307/2406664. JSTOR 2406664. PMID 28564982. ^ Fleming, Trish; Nicholson, Sue. "Who is pollinating Pr humiflora". Archived from the original on 2013-02-19. ^ Goldingay, R. L.; Carthew, S. M.; Whelan, R. J. (May 1991). "The Importance of Non-Flying Mammals in Pollination". Oikos. 61 (1): 79–87. doi:10.2307/3545409. JSTOR 3545409. ^ Sühs, R.B. ; Somavilla, A.; Putzke, J.; Köhler, A. (2009). "Pollen vector wasps (Hymenoptera, Vespidae) of Schinus terebinthifolius Raddi (Anacardiaceae)". Brazilian Journal of Biosciences. 7 (2): 138–143. ^ Cronk, J. K.; Fennessy, M. Siobhan (2001). Wetland plants: biology and ecology. Boca Raton, Fla.: Lewis Publishers. p. 166. ISBN 978-1-56670-372-7. ^ Glover, Beverly J. (2007). Understanding flowers and flowering: an integrated approach. Oxford University Press. p. 127. ISBN 978-0-19-856596-3. ^ a b New Living Science: Biology for Class 9. Ratna Sagar. pp. 56–61. ISBN 978-81-8332-565-3. ^ Culley, Theresa M.; Klooster, Matthew R. (2007). "The cleistogamous breeding system: a review of its frequency, evolution, and ecology in angiosperms". The Botanical Review. 73: 1–30. doi:10.1663/0006-8101(2007)73[1:TCBSAR]2.0.CO;2. ^ Baskin, Carol C.; Baskin, Jerry M. (2001). Seeds: Ecology, Biogeography, and Evolution of Dormancy and Germination. Elsevier. p. 215. ISBN 978-0-12-080263-0. ^ Igic B, Kohn JR (May 2006). "The distribution of plant mating systems: study bias against obligately outcrossing species". Evolution. 60 (5): 1098–103. doi:10.1554/05-383.1. PMID 16817548. ^ W. Scott Armbruster (2012). "3". In Patiny, Sébastien. Evolution of Plant-Pollinator Relationships. Cambridge, UK: Cambridge University Press. pp. 45–67. ^ Cardinal, Sophie; Danforth, Bryan N. (2013). "Bees diversified in the age of eudicots". Proceedings of the Royal Society. 280 (1755): 20122686. doi:10.1098/rspb.2012.2686. PMC 3574388. PMID 23363629. ^ Steiner, Kim E.; Whitehead, V. B. (September 1990). "Pollinator adaptation to oil-secreting flowers—Rediviva and Diascia". Evolution. 44 (6): 1701–1707. doi:10.2307/2409348. JSTOR 2409348. PMID 28564320. ^ Shao, Z.-Y. ; Mao, H.-X. ; Fu, W.-J. ; Ono, M.; Wang, D.-S.; Bonizzoni, M.; Zhang, Y.-P. (2004-01-01). "Genetic Structure of Asian Populations of Bombus ignitus (Hymenoptera: Apidae)". Journal of Heredity. 95 (1): 46–52. doi:10.1093/jhered/esh008. PMID 14757729. ^ Kuehn, F. Coordinator. (2015). Farming for native bees. World Wide Web electronic publication. Retrieved from . (Accessed: September 22, 2015). ^ "US Forest Department: Pollinator Factsheet" (PDF). Retrieved 2014-04-18. ^ Biesmeijer, JC; Roberts, SPM; Reemer, M; Ohlemuller, R; Edwards, M; Peeters, T; et al. (2006). "Parallel declines in pollinators and insect-pollinated plants in Britain and the Netherlands". Science. 313 (5785): 351–354. doi:10.1126/science.1127863. PMID 16857940. ^ Cox-Foster, DL; Conlan, S; Holmes, EC; Palacios, G; Evans, JD; Moran, NA; et al. (2007). "A metagenomic survey of microbes in honey bee colony collapse disorder". Science. 318 (5848): 283–287. doi:10.1126/science.1146498. PMID 17823314. ^ Woteki, Catherine (August 16, 2013). "The road to pollinator health". Science. 341 (6147): 695. doi:10.1126/science.1244271. PMID 23950499. ^ "EFSA Press Release: EFSA identifies risks to bees from neonicotinoids". Efsa.europa.eu. 2013-01-16. Retrieved 2014-04-18. ^ "ISCA Technologies: A Leader of Innovative Pest Management Tools and Solutions". Iscatech.com. Archived from the original on 2014-04-10. Retrieved 2014-04-18. ^ a b c d Neuschulz, Eike Lena; Mueller, Thomas; Schleuning, Matthias; Böhning-Gaese, Katrin (2016-07-20). "Pollination and seed dispersal are the most threatened processes of plant regeneration". Scientific Reports. 6 (1): 29839. doi:10.1038/srep29839. PMC 4951728. PMID 27435026. ^ a b David Ward Roubik. Ups and Downs in Pollinator Populations: When is there a Decline? ^ a b Carvalho, Carolina S.; Galetti, Mauro; Colevatti, Rosane G.; Jordano, Pedro (2016-08-18). "Defaunation leads to microevolutionary changes in a tropical palm". Scientific Reports. 6: 31957. doi:10.1038/srep31957. PMC 4989191. PMID 27535709. ^ a b c d Connolly, Christopher N. (2013-09-01). "The risk of insecticides to pollinating insects". Communicative & Integrative Biology. 6 (5): e25074. doi:10.4161/cib.25074. PMC 3829947. PMID 24265849. ^ a b Potts, Simon G.; Biesmeijer, Jacobus C.; Kremen, Claire; Neumann, Peter; Schweiger, Oliver; Kunin, William E. (2010). "Global pollinator declines: trends, impacts and drivers". Trends in Ecology & Evolution. 25 (6): 345–353. CiteSeerX 10.1.1.693.292. doi:10.1016/j.tree.2010.01.007. PMID 20188434. ^ a b Fairbrother, Anne; Purdy, John; Anderson, Troy; Fell, Richard (2014-04-01). "Risks of neonicotinoid insecticides to honeybees". Environmental Toxicology and Chemistry. 33 (4): 719–731. doi:10.1002/etc.2527. PMC 4312970. PMID 24692231. ^ Humpden, Nyamweya N.; Nathan, Gichuki N. (2010-06-01). "Effects of plant structure on butterfly diversity in Mt. Marsabit Forest – northern Kenya". African Journal of Ecology. 48 (2): 304–312. doi:10.1111/j.1365-2028.2009.01151.x. ^ Tylianakis, Jason M. (2013-03-29). "The Global Plight of Pollinators". Science. 339 (6127): 1532–1533. doi:10.1126/science.1235464. PMID 23449995. ^ a b Sluijs, Jeroen P. van der; Vaage, Nora S. (2016-06-01). "Pollinators and Global Food Security: the Need for Holistic Global Stewardship". Food Ethics. 1 (1): 75–91. doi:10.1007/s41055-016-0003-z. ^ a b Eilers, Elisabeth J.; Kremen, Claire; Greenleaf, Sarah Smith; Garber, Andrea K.; Klein, Alexandra-Maria (2011-06-22). "Contribution of Pollinator-Mediated Crops to Nutrients in the Human Food Supply". PLOS ONE. 6 (6): e21363. doi:10.1371/journal.pone.0021363. PMC 3120884. PMID 21731717. ^ Bascompte, J.; Jordano, P.; Melián, C. J.; Olesen, J. M. (2003). "The nested assembly of plant–animal mutualistic networks". Proceedings of the National Academy of Sciences. 100 (16): 9383–9387. doi:10.1073/pnas.1633576100. PMC 170927. PMID 12881488. ^ Bastolla, U.; Fortuna, M. A.; Pascual-García, A.; Ferrera, A.; Luque, B.; Bascompte, J. (2009). "The architecture of mutualistic networks minimizes competition and increases biodiversity". Nature. 458 (7241): 1018–1020. doi:10.1038/nature07950. PMID 19396144. ^ a b c Lever, J. J.; Nes, E. H.; Scheffer, M.; Bascompte, J. (2014). "The sudden collapse of pollinator communities". Ecology Letters. 17 (3): 350–359. doi:10.1111/ele.12236. hdl:10261/91808. PMID 24386999. "Pollination" . Encyclopædia Britannica (11th ed.). 1911.